The Weekend Gourmet: The Weekend Gourmet Hits the Road...Sea World/Aquatica San Antonio AND a Ticket Giveaway! 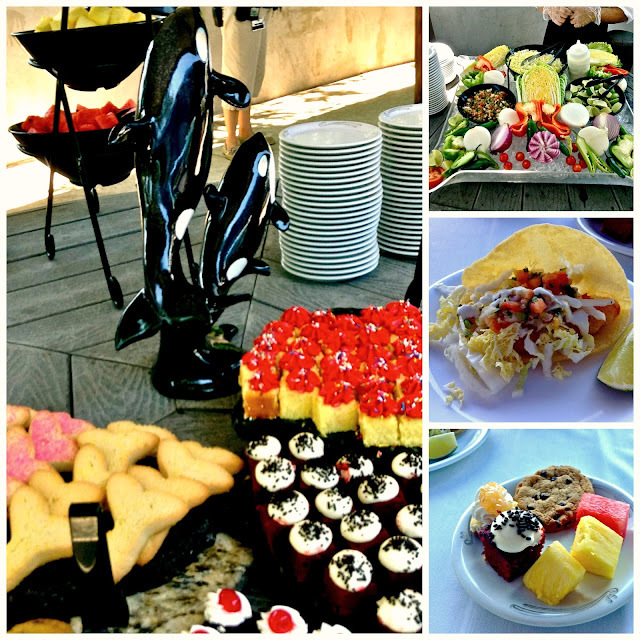 The Weekend Gourmet Hits the Road...Sea World/Aquatica San Antonio AND a Ticket Giveaway! One of the best things about living in a tourist-friendly city like San Antonio is that it provides local residents with tons of great options for fun day trips and short staycations! Michael and I live less than 10 minutes from the Sea World/Aquatica San Antonio, which means we can get our Shamu and water park fix whenever the mood strikes. Sea World/Aquatica recently invited us to come out and spend a fun day at the park -- including enjoying a fantastic buffet lunch as part of their Dine With Shamu upgrade package. It was a blazing-hot Texas day in mid-July when we visited, but we had a great time with our friends Bekah and Matt…and their young daughter Abby. We arrived and quickly parked our cars in the huge parking lot and walked into the park entrance. Hint: make sure to apply a goodsunblock liberally…the Texas Sun can be brutal! I am very fair-skinned and burn easily, so I used an SPF 79 sunblock and only burned on my scalp…which I somehow forgot to spray with sunblock. On that note, a cap or hat is a good idea too: it’s perfect for providing a bit of shade and protection from the Sun. We also knew it was important to stay hydrated, so our first stop was the gift shop to buy a big bottle of water to share. Face it, heat stroke can put a real damper on your fun! 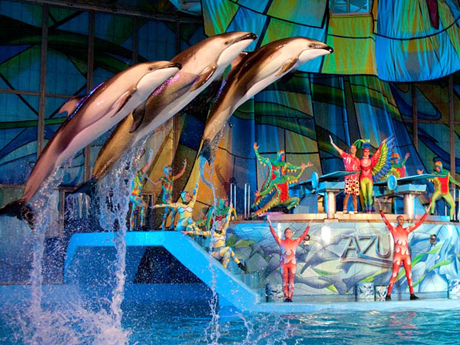 After this prep work, our first order of business was to see Azul, a show features a variety of diving and acrobatic performers and lots of talented animals too: dolphins, beluga whales, and colorful parrots to name a few. The show is fun and entertaining for kids...of all ages! By the time the Azul was over, it was time for our lunch date with Shamu! We made our way to the Shamu Theater and were escorted to an area in the back that's not normally open to the general public. We were greeted by several friendly and helpful members of the Sea World staff, then shown to our poolside table. After drinking some ice water to cool off a bit, we quickly made our way over to the buffet line. The array of food was quite impressive: a fish taco bar, a wide variety of kid-friendly items like hot dogs and chicken fingers, lots of fresh fruit and a large display of colorful mini desserts. The meal is served outdoors, but the area is well shaded...and they provide lots of ice-cold drinks to help you stay cool and hydrated. While we enjoyed our tasty food and iced tea, Shamu’s trainers were on hand to answer our questions about Shamu’s training schedule, what and how much he eats each day, etc. The trainers were very friendly and informative, then it was time to meet Shamu up close and personal. He performed a few tricks and then stopped by our table to say hello and pose for some pictures. It was such a fun treat to have the opportunity to see Shamu so close and watch him interact with his trainer. Before we knew it, our Dine With Shamu experience was over…and we were ready to cool off some more. Penguins to the rescue! The Penguin Plaza at Sea World San Antonio is housed inside a large air-conditioned building, so we were able to cool off and enjoy the playful antics of the penguins. Talk about a win-win scenario…I ADORE penguins! We noticed the lights were out inside the climate-controlled penguin habitat, so we asked a staff member why. They told us that Sea World recreates the penguin’s natural habitat to the smallest detail, including sunrise/sunset patterns. It’s dark midday where the penguins are from, so it was dark inside in midday San Antonio too. We had to get up close to the glass to see them clearly, but they were frisky and playful! After about an hour of watching the penguins play and swim, we headed over to the Aquatica side of the park for the remainder of our visit. This nature-themed water park has a huge wave pool, several water slides…and a large Sesame Street-themed water play area just for the little ones to enjoy. 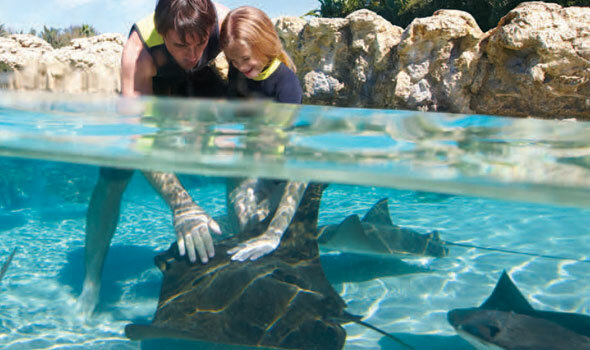 It’s perfect for cooling off, and there’s even a stingray cove! We had a blast playing in the wave pool, riding the thrilling water slides and generally acting like big kids. Before we knew it, it was 600 and time to head home. We were tired after a busy day, but in that “we had a great time” kind of way! Sea World/Aquatica San Antonio is a fantastic day trip for families -- whether you live here in San Antonio or are planning a visit. There’s something for kids of all ages, so you’re guaranteed to have fun. We sure did! 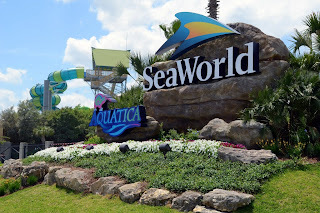 To share the fun, Sea World/Aquatica San Antonio is going to give one of my readers a complimentary pair of tickets to Sea World/Aquatica! The tickets are good at the San Antonio location only, and they can be used until January 5, 2014. If you live nearby OR are planning a San Antonio getaway in the next few months, be sure to enter. To do so, leave me a comment letting me know what you would enjoy most about a visit to Sea World/Aquatica. Make sure to leave your e-mail address so I can find you if you’re the winner. I’ll accept entries until this Saturday 8/17 at 1159 pm CST. I will notify the winner via e-mail on Sunday. Good luck! Disclosure: Sea World San Antonio provided The Weekend Gourmet with a four pack of one-day park admissions to facilitate this article. All opinions expressed are mine. Some pictures were provided by Sea World.